Reverend announced the Roundhouse RT guitar yesterday, the latest addition to their Set-Neck Series. The Reverend Roundhouse RT Guitar is a Les Paul look-alike guitar that comes with the last innovated features, which include two Reverend RevTron pickups loaded in a single-cutaway solidbody, block inlays, neck binding, Reverend Pin-Lock tuners, and Bass Contour control. The pickups are custom designed — producing an aggressive but warm tone due to being a bit hotter (RevTrons are wound about 5% hotter overall than the originals for more sustain and punch) than the original pickups. The bridge pickup is slightly hotter then the neck pickup for balanced tone and volume. The solid korina body and neck (1-piece), medium oval neck profile, rosewood fingerboard, 22 medium jumbo frets, 24.75? 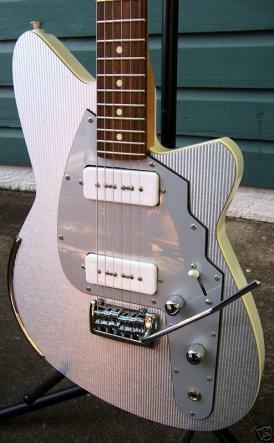 scale length, Tune-o-Matic bridge with stop tail, 2 Revtron mini-humbucker pickups, 3-way pickup switch and volume, tone and bass contour controls. This contributes to a resonant, light, and lively instrument that responds to the player’s touch. The RT tone is warm but focused, with an aggressive upper-midrange chime that can cut through a band mix.